Ok, Tom Brokow, I am going to call it. 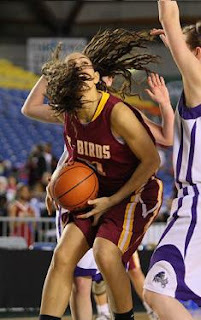 I am predicting based on exit polling of my different contacts, that Carrie Ojeda from Mount Tacoma high school in Washington will or has already signed on to play for Tricia Binford and Montana State Bobcats women’s team. Carrie Ojeda is a 6-0 player who averaged 20 points, 12 rebounds, 5 blocks, 3 steals, and 2 assist while shooting 55% from the field (37% 3fg) and 60% from the line. For the first half of the season she led the state of Washington is scoring at over 26 per game, but had some injury problems mid season that hurt her average. 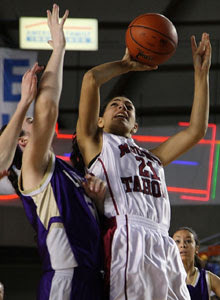 Her best game of the season was a 42 points, 17 rebounds, and 7 blocks game against Mercer Island high school. Ojeda is an All-Narrows League Bay Division First Team selection. Ojeda is also a very accomplished track athlete, in the high jump, long / triple jumps and the 4×100 relays. Ojeda is a typical Binford recruit, athletic and with the ability to play more than one position. While Ojed a, was recruited by the ‘Cats to play the power forward spot, she has the toughness to play the center position, and the perimeter shooting, and athleticism to play the small forward. I think she will remind a lot of Cat fans of Nubia Garcia. She is a very physical player, who does not mind doing the dirty work, and plays defense. Her defense though is an area that she could use, a little bit of refinement in. As a shot blocker and an interior defender she has at time swatted/hacked too much at the ball. She needs to get a little smarter some times about how she plays defense.